Some are comparing it to the Terminator. To me it’s more reminiscent of Cleatus, the Fox Sports football robot: physically imposing, but—one suspects—not terribly bright. The engineers at DARPA and Boston Dynamics may lack Steve Jobs’ aesthetic sensibilities, but Atlas extends their long track record of pushing the boundaries of humanoid robots’ physical abilities. Their Cheetah robot can match Usain Bolt’s speed; a version of their Petman robot (actually an early prototype for Atlas) managed to negotiate an obstacle course. Atlas is their most advanced effort yet, with an on-board computer, 28 hydraulic joints, and LIDAR and stereo sensors in its head. The robot will serve as the shell for the seven teams competing this year in the DARPA Robotics Challenge. The teams will install software brains aimed at allowing Atlas to complete a series of tasks similar to what might be required in disaster-response or emergency-rescue situations. 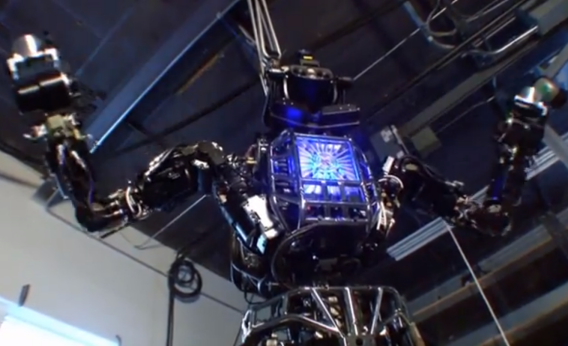 That’s a tall task for robots, which tend to have Hulk-like strength but terrible coordination compared to humans. In the video above, Atlas neatly sidesteps a two-by-four on a treadmill, which is impressive from a technical standpoint, but obviously only a small step toward actually negotiating messy human environments. You can read more about the DARPA Robotics Challenge here and see some of the contestants’ previous efforts in the video below. May their work be used for good and not evil—or, failing that, may it continue to be pretty much useless in the real world for the foreseeable future.